Cable Co-op will be upgrading its Interactive Guide. The upgrade will begin in May and is anticipated to continue through the end of the year. Sleek, new high-resolution user interface – the modern, wide-screen (16:9) display looks great on HDTVs with a new black & grey color-scheme and crisp fonts. HD Auto-Tune – now you can always enjoy your favorite shows in the best resolution. 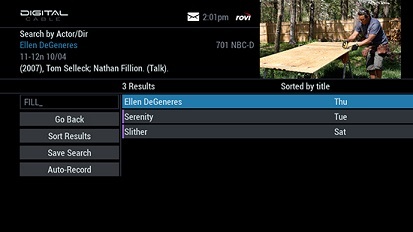 When tuning to an SD channel, i-Guide will automatically tune to the HD equivalent (when available). DVR Live buffer increases – the release increases buffering of HD content to 90 minutes. Genre color-coding layout – the grid now has color-coding bars on the left side of the cell – replacing full color of grid cell – for a more streamlined design. Color-coding remains the same: purple for movies, blue for kids and green for sports. You can easily set favorite channels and can even set up to five Favorites lists.